Days after measles outbreak in Manipur’s Churachandpur, the District Family Welfare Office (DFWO) of Churachandpur swung into action and administered Measles-Rubella (MR) vaccination to many children in the district headquarters. 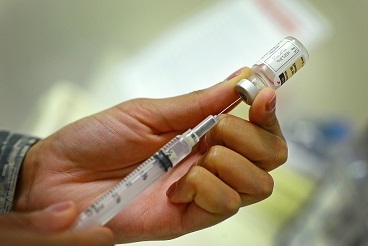 Measles outbreak in the hill district had claimed life of a five-year old girl besides affecting three other families of two villages Monglenphai and K Sinai under Churachandpur district headquarters about 65 km south of Imphal. The victim died on June 5. So far, no fresh case has been reported till the filing this report. Meanwhile the DFWO has started vaccination at seven localities in Churachandpur town in spite of being a holiday in the area on Saturday. The MR vaccinations were conducted at Hmuia Veng, K Sinai S. Kunglal Veng, Hengkom Veng, S Muoldung Veng, K. Commissariat and K Khomunnom, sources added. Meanwhile, 183 children have been vaccinated at Monglenphai while 28 children have been given vaccination at K Sinai since Friday. Outbreak of Measles was confirmed at these two villages. According to DFWO Dr Jam Thianlal, the mass vaccination was undertaken as a measure to control measles outbreak. He said K Sinai has 15 households. Of these, 5 houses are found locked as they were reportedly out of station. At the same time, 13 children from three families of K Sinai are reported as ‘already vaccinated at school’ by their respective parents. But they could not produce supporting documents, DFWO added. It may be recalled that MR vaccination campaign in Manipur was held from March 26 to April 30 this year with an objective to vaccinate as many as 8,5 lakh children (9 months to 15 years old).